Saturday night’s weather forecast predicted we might soon see the sloppy kind of April snow showers we get a lot of around here. So far only more rain. But on Saturday, in between rain, the wind blew the clouds off to the east and the north, and the sun came out. It was the kind of day when the wind dries the clothes on the clothesline while they dance to it, and you can’t really take your jacket off for long, but it’s not too cold to be outside poking around in the yard and enjoying the sun. Last year I never got around to weeding out my overgrown Italian parsley patch. Maybe a third of it got (sort of) done. Enough to throw a few carrot seeds in and hope for the best. But when Fall came I didn’t find many carrots. This Spring I vowed to get an early start on cleaning up that patch, at least Maria style. So I’ve been out there picking away at it, every time it’s wet enough from rain, yet warm and dry enough to try. Although I’m mostly no-till when doing it by myself, since the ground was nice and wet, I thought I’d grab the shovel and work on a huge clump of grass growing into it at one of the corners. My foot sunk the edge of the shovel in nicely. I love the feeling of pushing the shovel into the earth. The fact that I can do this at all continues to be one of my more cherished Little Victories over Multiple Sclerosis, since before I became a low fat plant-based eater I could no longer even bend over to pull a weed out without putting myself in peril. That situation has continued to improve steadily each season. As I lifted the clump of soil and grass out, I saw something bright orange. 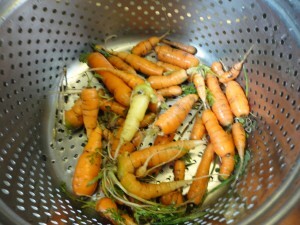 I had unearthed some carrots I didn’t know were there! So I spent the next half hour pressing into the edge of the patch and lifting clumps of wet earth to find carrot after carrot after carrot. Little ones, of course. Funny looking ones, of course. 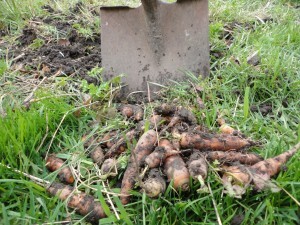 But carrots, even one yellow one, that had made it through the Winter. I began laughing all the way to the lunch table. I had already planned to have the last of my lemony kale pesto mixed in with the last of the quinoa, along with some small German Butterball potatoes from last year I found hiding when I dug up another patch of ground. 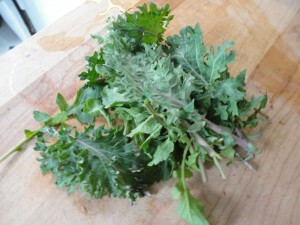 And a true handful of greens, arugula and kale, that also made it through the Winter. To warm everything up quickly, I wilted the greens slightly in the pan with a little water, before adding the leftover quinoa and pesto. 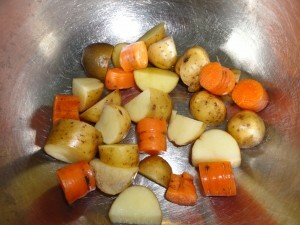 And now that I had these little carrots, I tossed a few in with the potatoes to roast. 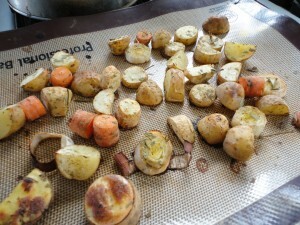 Last year’s dried lovage also spiced them up, along with a little extra poultry seasoning and the addition of some parsnip, a little sliced leek, and a splash of lemon juice. They went into a 400 oven for probably about a half hour. I was going in and out and forgot to set the timer. 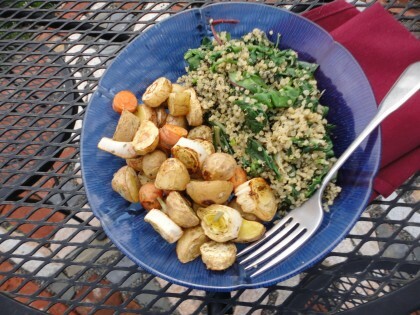 I certainly didn’t think I’d be writing about it, but it was such a delicious mother lode of garden fresh leftovers that I decided to share the wealth. It’s not often that “leftovers” are actually so fresh they’ve hardly been out of the ground for an hour before they get eaten. I even got to enjoy them outside on the beautiful galaxy patio my friend Clark made for me last year. 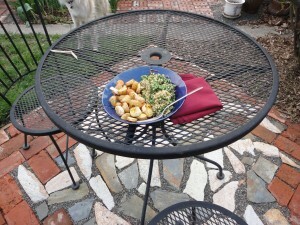 My first outdoor meal of the season. The poet T.S. Eliot famously wrote that “April is the cruelest month.” But as far as I’m concerned, let April snowfalls come and go, no matter how gloppy. I’ll take this day and its miraculous meal as a sign it’s going to be a good year in my garden. Thanks, always, for your wonderful sharing posts. Blessings! Your writings always bring joy to my heart and a smile to my face. Here’s to surprises. I love them so. Dear Ginger, Julie, and Kathleen–thanks so much for being faithful, supportive readers!! Here’s to surprises and serendipity (one of my favorite words)–blessings back to you!! 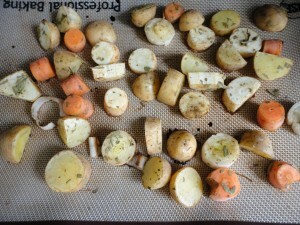 if you use one of those silicone mats does that mean you don’t have to bake the veg with any oil? Hi kally, yes, that’s exactly right. I either use the silicone mat or baking parchment, and I don’t need to use oil. What a lovely meal! Such a treat as you stated. Makes me wish we were neighbors and I could invite myself over for lunch some time! Of course, the same would apply you! 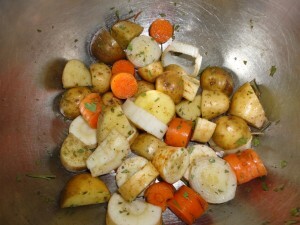 I just love roasted veggies. 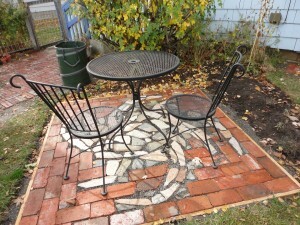 Your patio looks so inviting, having the 2nd chair made me feel like it was there just for me! Thanks for another wonderful story Maria. Dear Marcia, you have a standing invitation! Meanwhile, I’m glad you felt so invited in this “virtual” way. Thank you! I also do not know what lovage is; I like the name though. I enjoyed this window into April in your world, Maria. I never minded April’s fickleness myself – I think of it as Spring’s November. Lovage is a very hardy perennial herb once established–its taste is somewhat similar to celery, though it’s a little spicier. Even a bit licorice-like. It’s a great addition to salads, soups. It is good for the complexion and digestion. An old-fashioned herb. I believe its name is a corruption of “love-ache.” It can grow quite tall. My neighbor has a mammoth one that grows over my head, which is where I got my stash and where I fell in love with it last Summer. I have been painstakingly starting seeds, and several of them have sprouted. 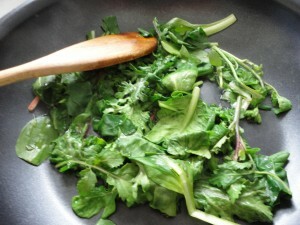 Stay tuned later in the season for a post on lovage! And Nicole, “Spring’s November”!! How perfect! !